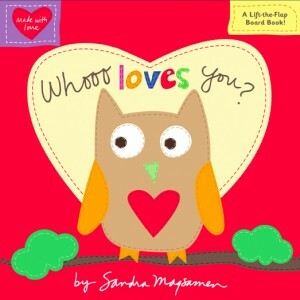 I read this lift a flap board book (a review copy from the publisher) to both my 1 year old and my 3 year old. My 1 year old was interested in pulling at the flaps which, sadly, are a structural weak point in a book with otherwise sturdy pages (which is the case with most lift-the-flap books in the hands of babies, I’ve found). My 3 year old loved the word play and had me read it several times to her before “reading” it to her brother by herself. Each two page spread features animals making varied statements of love. 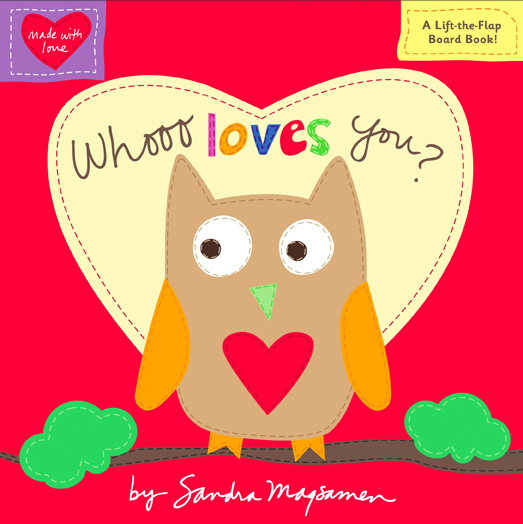 The birds sing about “tweethearts,” a cow says “I moo you,” an owl says “owl always love you,” and puppies say “we ruff you.” At the end of the book the reader says “I love you, I love you” to a child. The artwork is bright and, in what I presume is the artist’s signature style (we already own another book of hers, Peek-a-Boo, I Love You! ), the animals are all depicted with hidden hearts (for example, the cow’s spots are heart-shaped). A cheerful read aloud for ages as old as 3.